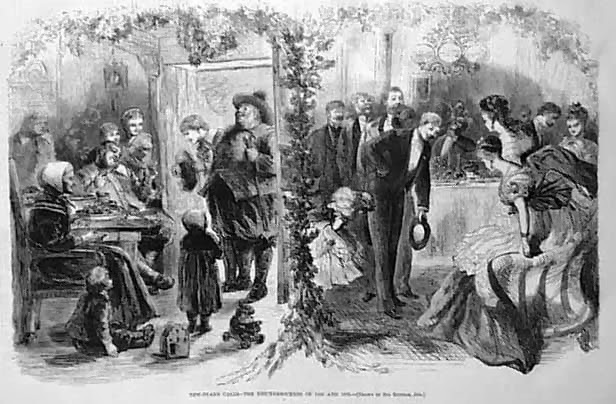 New Year’s Calls started by the Dutch in the 1600s compared to the New York socialites of the 1870s. The image of two New Year’s Calls by the 'Knickerbockers' of 1650 and 1873 is from Harper’s Weekly, 1873. The following description is from the 1623-1664 section of Todd's 1888 book on NYC. "Nieuw Jar…New Year is the greatest day in New Amsterdam [New York]. On that day no one does aught but call and receive calls. For days before, the housewives have been brewing, baking, and mixing, and when the day cometh and thou goest to greet thy friend, thou findest the great logs crackling in the twelve-foot fireplace, and in the centre of the table, spread in the middle of the room, a mighty punch-bowl well reinforced by haunches of cold venison and turkeys roasted whole, and ornamented with cakes, comfits, confectionery, silver tankards, and bekers filled with rare Madeira and foaming ale. The good vrouw and her daughters, clad in their best, are there to receive one, and to dispense whole-hearted hospitality, smiles, and good wishes." What, no dropping ball? ;-) At least the excesses of food and drink are still part of the New Year's tradition in what we now call New York. I remember when the ball was an apple... the "Big Apple."